Lake level is still declining with 16,000 acre feet of water flowing into the lake while 24,000 acre feet flows out. Water temperature is climbing with early morning temperature now at 59 F. Hopefully the warming air temperature will allow the runoff to increase and allow the lake to rise. Water clarity is still crystal clear in the southern lake. It is possible to see the bottom in 30 feet of water in some locations. These warming conditions have ushered in the expected behavioral change in adult striped bass that are waiting to spawn. Each spring adult stripers migrate back to where they were spawned, similar to salmon running upstream to their nursery location. Stripers spawn at night so they are not that easy to find during the day. Stripers spawn on the surface so there are no nests to mark the location of the spawning event. The evidence of the spawning location is the early morning presence of large schools of stripers swimming on the surface as they wait for the 10 degree temperature spike which is the trigger that allows spawning to occur. That trigger would be an early morning water temperature of 62-64 degrees which increases to 74 or above in the afternoon. While waiting for the temperature increase, the striper schools pass the time by swimming aimlessly near the surface, slurping up tiny microscopic plankton in the early morning hours. When the morning sun hits the water the school drops down to 40 feet or more and waits for that spawning trigger. Usually spawning occurs between May 10 and June 10. Over the years we have found some of those spawning locations. Some pre-spawn holding locations are marked by high canyon walls on the east side of the lake which offer extended shady periods. The sun now comes up about 6:30 AM (MDT). The eastern sky begins to lighten about 30-45 minutes earlier. The events described here occur between 5:45 to 8 AM or when the sunlight hits the water in different locations. As we checked out a spawning location in Padre Bay yesterday, my heart skipped a beat as a school of stripers was seen slurping plankton on the surface. A number of fishing techniques were deployed to see what would be most effective. We trolled over the school with small crank baits trailed way behind the boat. The school sounded and then returned to the surface about the time our lures were in range and a few 3 pound stripers were caught. We fast trolled Clouser Minnow flies just under the surface and caught a few fish. We stopped in casting range of the feeding school and cast jigs, small crankbaits and flies and caught a few fish. 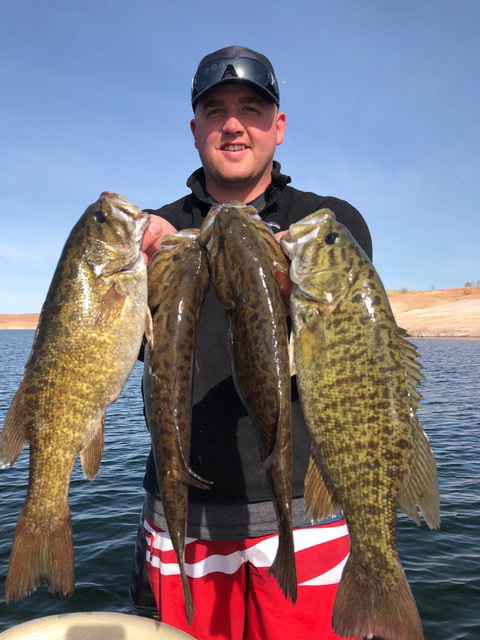 When the school left the surface, we dropped spoons down to the fish seen on the graph at 40-80 feet and caught a few fish. It was intense, breath taking and very satisfying to be back interacting with spawning stripers again. The sun hit the water way too soon and the morning action was over. A few more spots were checked by trolling in the backs of canyons at a water depth of 25 feet in murky water. We ended up with 34 stripers back at the fish cleaning station. Those fishing bait in the main channel came in about the same time and most had 10-20 stripers for the morning trip. Fishing has picked and will continue to be good to great for all of the month of May. Largemouth and smallmouth bass were seen guarding many nests in the southern lake. Those anglers seeking spunky bass were smiling as well. Fish size and health is great right now. Walleye fishing is heating up in the northern lake. Spring spawning season is here with the daily air temperatures in the 70-80 range. There will be some afternoon winds so the best fishing will be in the early morning over the next 10 days. Quality of life is measured by amount of time spent fishing.